In April, hackers broke into Sony's online network, gaining access to the personal information and passwords of some 77 million PSN and Qriosity accounts. The attacks were believed to have been performed by Anonymous, a group of hackers who's aim is to punish global companies involved with supporting censorship on the internet. For these hackers, it appears they might not have been as anonymous as they thought. According to the New York Times, Spanish police Friday June 10th confirmed that they apprehended three men in connection with the Sony security breach. 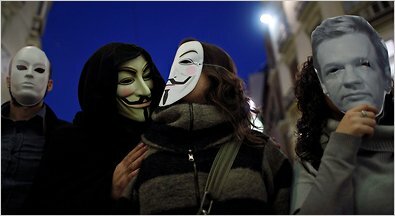 The police believe they were involved not only with the attacks on Sony, but with other strikes against government websites the world over, and characterized the trio as the local heads of Anonymous. What is not clear from the report from Spanish authorities is whether or not they are the actual perpetrators involved in the Sony case. This could be a misguided attempt to blame known anonymous leaders residing in Spain. The reason that arresting anyone in connection to the Sony hack may prove difficult is that Anonymous is a large organization of hackers world wide according to the the New York Times. They are an internet activist group largely in opposition of the arrest of Julian Assange head of Wiki Leaks. Anonymous seeks to punish corporations or governments that aim to silence communication on the internet. Anonymous has claimed responsibility for the Dec. 8 attack on MasterCard, which had stopped processing donations for WikiLeaks. Other targets included PayPal, which stopped accepting donations for Mr. Assange’s group. Visa.com was also affected by the attacks, as were the Web sites of the Swedish prosecutor’s office and the lawyer representing the two women who accused Mr. Assange of sexual misconduct. The group said the actions were part of an effort called Operation Payback, which began as a way of punishing companies that attempted to stop Internet file-sharing and movie downloads. There seems to be no connection why hackers would want to infiltrate video game networks when they have made their protest against censorship public. "Sometimes not everything is as it seems"......from the movie V for Vendetta."